Daily Illuminator: Band Together, With GURPS! March 15, 2015: Band Together, With GURPS! GURPS Fourth Edition has provided a plethora of options for codifying various elements with stats: cities, armies, spaceships, and more. Now, we're bringing at-a-glance stats to organizations and groups, with GURPS Boardroom and Curia. This supplement will help you describe organizations, stat out their abilities (and limitations), provide their response times and resources, and other essential intel. Written by Matt Riggsby (author of GURPS Fantasy-Tech 1: The Edge of Reality), Boardroom and Curia also includes rules for how to use these stats when the heroes work for or against an organization . . . or even decide to found one! It further offers seven sample groups, including the Medici bank, Biotech Euphrates from Transhuman Space, a superhero alliance, and more. 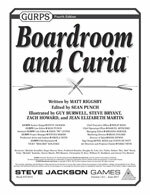 With GURPS Boardroom and Curia, you'll get organized like never before!